This is it. We are moving house, moving state, moving region! Iâ€™ll be gone in a couple of days, homeless during the drive, and then a homeowner in a couple of weeks. Thatâ€™s the plan anyway. In my new home, I will have room to set up an actual art table, maybe even a whole room, and can get some equipment to do welding in the garage. 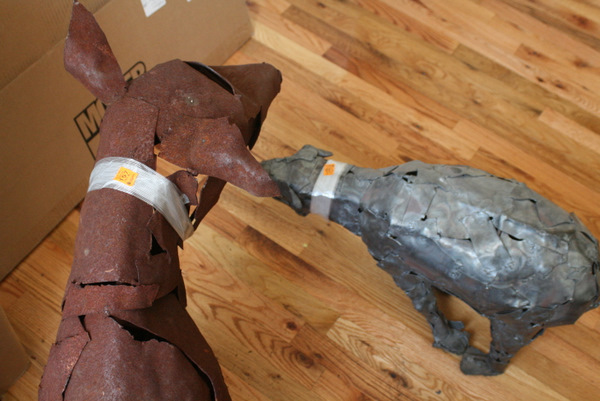 Scary and exciting.Â Some of the artwork is too big and heavy to pack, like the dog (“Rusty”) and the bear (“the bear”). I gave them tape collars so that the little orange mover stickers would stick.